1) Coney Island. If the city is committed to it audacious Coney strategy--rezoning, buying out developer Joe Sitt in the amusement district and/or doing some land swaps--2008 will be an eventful year. If there isn't much progress next year, stick a fork in the new plan and wait for the new mayor. 2) New Domino. Any project as big as the New Domino is not going to be a slam dunk, so count on it generating some noise in 2008 as the plans move forward. 3) Gowanus Rezoning. 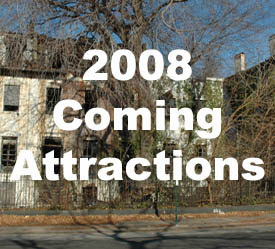 The city will pick a development team for the toxic Public Place site in 2008. Will the Bloomberg Administration ram through the high density residential rezoning that developers like the Toll Brothers want? 4) Carroll Gardens Development. Residents are getting increasingly testy about out-of-context development and appear ready to fight every big development announced in the neighborhood. We don't think 2008 will be a quiet year as newly energized neighborhood activists aren't going to give up without a huge fight. 5) Red Hook Gridlock. Of course, there's a chance that everything will go smoothly when the Ikea opens on Beard Street next year. We could be wrong, but we think there's going to be major traffic chaos as up to 50,000 cars a week pour into Red Hook. It's going to be ugly. 6) Developer Bloodletting. As the residential market softens, look for a lot of marginal Brooklyn condos, especially smaller ones in Williamsburg and the South Slope, to turn into white elephants. We're seeing major price cuts, buildings going rental and the possibility of bankruptcies among developers without deep pockets. 7) Subprime Pox Spreads. While buyers in affluent Brooklyn neighborhoods aren't being hit, parts of low income neighborhoods that were epicenters of the subprime mortgage market are being decimated. More awfulness to come in 2008. 8) Dock Street. Dumbo developers David and Jed Walentas have hired lobbyists and battle lines are hardening over the 18-story Dock Street development that Two Trees wants to build near the Brooklyn Bridge. They've intimated that they can build a 35-story hotel on the property without getting anyone's approval. It could get very ugly. 9) Ratner-Renzo Tower. Mr. Ratner's bold plan for a Renzo Piano-designed building that would be Brooklyn's tallest, will not continue to fly under the radar. 10) Admirals Row. Will these historic buildings be creatively reused or turned into a parking lot for a supermarket? 2008 should provide answers. 11) Bushwick Inlet Park. Will the city's big new park plan for the Williamsburg-Greenpoint waterfront move forward? Or will there be some eminent domain-related wrenches thrown into the works? 1) Whole Foods Throws in Gowanus Towel. What's up at the Gowanus Whole Foods site? Is the grocery chain backing away from developing a below ground grocery on a site with toxic issues that is in a flood plain? If nothing happens by the middle of next year, it might be time to rethink this one. The grocer wouldn't opt for a Sunset Park location or go to Williamsburg first, would they? Eh, this will probably look like a stupid prediction by February. Or not. 2) Williamsburg Waterfront Slowdown. There are odd rumblings along Kent Avenue that could indicate the waterfront boom will not be going ahead with the speed that was originally anticipated. Does it mean delays for additional Toll Brothers towers? Will The Edge be a little less sharp? We're sensing less unbridled optimism than in the past. You know, every time you mention Admirals Row, you describe them as being replaced by the parking lot of the supermarket. As I've pointed out to you before, the houses would not be demolished just for the parking lot, but for the actual supermarket itself too. It's not a big difference but as you are surely aware it makes a big rhetorical difference. I'd appreciate it you at least paid attention to the very minimal standard of journalism and present the facts without spinning them too much to meet your ideological points.